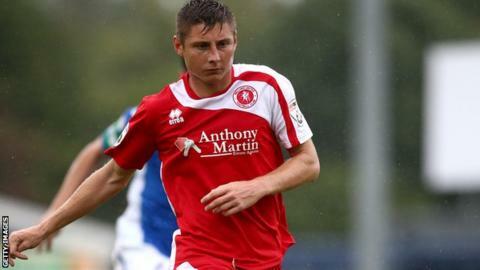 Peterborough United have signed midfielder Harry Beautyman on loan from Welling United, with a view to a permanent deal in January. The 22-year-old has has scored 11 goals in 21 appearances for the Conference club this season. He joins a Peterborough side currently seventh in League One following Saturday's home defeat by Swindon. Beautyman began his career at Leyton Orient, but moved on to Sutton United before joining Welling in 2013. "I left Leyton Orient when I had just turned 19," he told BBC Radio Cambridgeshire. "I dropped into non-league and I've worked my way back up the hard way. "I'm not too sure if it was true, but Barnsley and Swindon were supposed to be interested and numerous League Two clubs. "But as soon as I came here I knew this is where I wanted to sign." Welling boss Jamie Day told the club website: "He has been first-class to work with and to manage. His attitude has been fantastic and he fully deserves this chance,"
"His goals and workrate this season have been valuable and he deserved his recent England C call-up. "It again shows that this club can work with good young players and move them onto full-time football."